Home of the Phone Camera Blocker! Where we provide safety from camera spying by hackers or anyone else that might be able to access your camera via the internet. Our Primary product, the SecDotX or Phone Camera Blocker, is designed specifically to protect individuals and businesses from prying eyes. It is a LOW TECH SOLUTION TO A HIGH TECH PROBLEM. 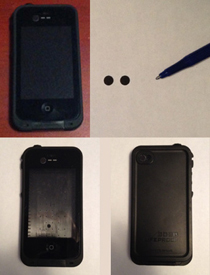 The Phone Camera Blocker can be purchased with custom designs and sizes but is presently sold as a dot to minimize blockage of any other part of the device it is being used with. The Phone Camera Blocker can be used with waterproof cell phone cases and will not move so privacy in the shower is also provided. The Phone Camera Blocker can be easily removed and used again and again but will not fall off when using the phone or when putting the phone into your pocket or a purse. With such a low price any individual can easily provide protection for their families and businesses can easily provide customer/internal protection. Cell Phone, Xbox, Tablet, Web Cam............the possibilities are endless.